The staff at NYFAX, observe and report on the sudden coup by Herod's forces as they overthrow Doom's government. 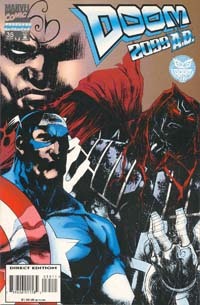 As part of a mandate by the newly appointed President 'Steve Rogers,' SHIELD forces begin to hunt down all super-heroes. The Punisher, Metal Scream, Galahad, and the Hulk all fall before SHIELD kill squads and Herod's wave-spider's. Ultimately SHIELD forces break into the NYFAX media center and kill them all for portraying the heroes in a positive light and calling upon the audience to disobey. 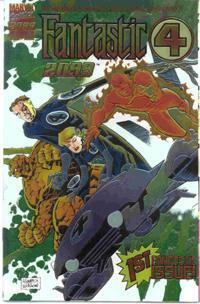 Appearances by Punisher, Hulk, Metal Scream, Galahad, and Captain America 2099. "1) The office never sent out any reference, so, in writing it, I kinda had to make it up as I went along, following vague details given on the phone. 2) When the script went in, no-one phoned to tell me that the Punisher was actually in a big honkin' gun, The Hulk was supposed to have mutated, and all of that. They just ran it. God knows why, as I was writing WELL ahead of publication time. The continuity should have been in place for this book, but someone in the office appears to have decided against it." In the Negative Zone, a volt storm hits a group of workers and short circuits the stasis field of of four individuals in stasis pods. On Earth, a mysterious mutant known only as Dust journeys to Halo City in search of a group of trouble young mutants. Among one of them he believes is the mutant messiah who must be protected from Herod. Once within the city, Dust seeks out Cerebra of the X-Men to enlist her help. She takes him to see Morphine Somers who, after some convincing, takes them both to the sublevels of the administration building where he has kept the group. Face to face with the children Dust calls upon them to not give up on the dream of a better life for mutant kind. In Manhattan, a lone figure begins to fight crime along the Thirteenth Street line, otherwise known as the Fault Line. The vigilante stops a drug dealer from giving away a free sample drug to a family and discovers an Alchemax plot to use the new drug to bring about sterility among the inhabitants of Downtown. Elsewhere in the city, Suzanne Carter and Mirielle Radley launch a missile into an Alchemax building as part of their activities in the Re-Activ-8 movement. The dark vigilante who patrolled the Fault Line observes this attack and enters the building through the newly made hole. Once inside he confronts the creator of the sterility drug, Frank Wilson and forces him to take all of the drugs he made. "...he's just some loser mutant who never had the guts to join the X-Men in the late 20th Century." At the former location of the White House, Captain Wark of SHIELD surveys the destruction and wonders when someone will explain to her what is going on. She then receives orders that all members of Doom's government are to be killed on sight. Nkrumah is found in the rubble and he claims diplomatic immunity. Elsewhere, Indigo Eshun is on the run. She jacks into one of the public dive booths she established only to be killed as soon as she enters cyberspace. In LA, the population is being decimated by gamma radiation. Sharp Blue attempts to contact Doom to inform him of the situation when suddenly they are attacked by Wave Spiders. Blue quickly learns of the coup and the warrant for her death. She and the other mercs escape the wave spiders and head for Mexico. Back in Chicago, Herod meets with Captain America and informs him that he is now president. Cap objects because there was no vote or democracy. 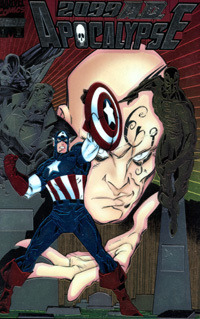 Herod then strikes Cap with an energy device. Bloodied and wounded, Cap asks what Herod wants. He explains that he wants to bleed America dry and relocate off world then do it again somewhere else. Cap agrees to help so long as it involves killing people. In Washington, SHIELD agents find a single glove from Doom's armor in the rumble that was once the Oval Office. Herod identifies himself as Anthony Herod. He was previously identified as John Herod. The Official Handbook of the Marvel Universe has settled his real name as John Anthony Herod. 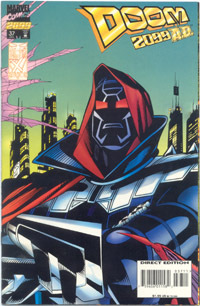 The only issue of Doom 2099 in which Doom does not appear at all. Final appearance of Indigo Shun, Nkrumah, and Sharp-Blue. Static Annie is on the run from SHIELD agents. She's a mutant and therefore to be shot on sight. The agents hit her with an inhibitor spike so that her powers don't work and hunt her like an animal. Across Washington, Carno-Tech towers sprout everywhere, especially near large concentrations of people. It ominously releases spores. All over, Herod's forbidden technology begins to spread, like the Wave Spiders which begin to procreate for the first time. Still running from SHIELD, Annie attempts to hide inside a warehouse. The agents pursue her with heavy weapons. As the agents search for her, Doom emerges and kills them one by one. When they are all dead, Doom finds Annie and tells her to come with him. Annie takes Doom to the home of Renfield, a man supposedly involved in the Re-Activ-8 revolutionary movement. Doom wants to use his resources to plan his revenge on Herod and his journey to Halo City. After some convincing, he allows them refuge. Back at the site of the White House, Herod uses nano-machines to construct a new home for the president, the Red House. Meanwhile, Doom uses Renfield's computers to extract his data files on the Driver. He then manages to commandeer the Driver's vehicle, the Nitro-Burn. Using her mutant ability to communicate with computers, Annie takes control of the Nitro Burn and the Driver. She brings the vehicle to Renfield's base. Wave Spiders arrive on the scene tracking the signal. 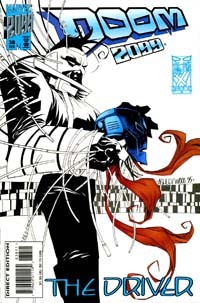 While making his preparations to escape in the Nitro-Burn, Doom shoots and kills Renfield for having pointed a gun at him when they first met. SHIELD agents raid the base only to be killed in an explosion triggered by traps set by Doom. Meanwhile, Doom uses access codes which he procured from cyberspace to rig the Wave Spiders and SHIELD vehicles to self destruct. Safely aboard the Nitro-Burn, Doom and Annie journey to Halo City. 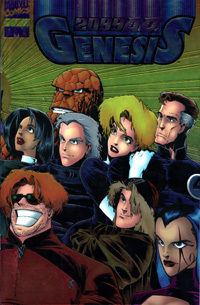 Aboard the vehicle, they find that the Driver has continued his mission to collect mutants, only now he just holds them prisoner. They find their rotting remains. When they reach Halo City, Annie can no longer control the Nitro-burn and they crash through the wall. Doom has Annie release the Driver as he can locate him again anytime. He also releases explaining that she is free in the mutant city-state. Entering a secret base underneath the city, Doom contacts Xi'an Chi Xan and requests him to send him Cerebra and Billy Zedd. In the Red House, Captain America asks Herod about the rumors that Doom is alive. Herod explains that they are likely not true, like Elvis sightings. He also explains that with the Undead that Morphine Somers will be giving to him, he will be able to shave off 2 years from his 5 year plan to strip mine the Earth. As a bonus, Morphine also plans to hand over the X-Men. Meanwhile, in Halo City, Billy Zedd arrives at the address given to him by Xi'an. To his surprise, Doom is there and asks that he build him a new suit of armor. Elsewhere in the city, Xi'an tells Cerebra to visit the same address. Shortly, Zedd has finished Doom's new armor. Equipping it with everything his previous armor had plus some new features. Doom then decides to go visiting. First he meets with Morphine Somers and warns him that he is disappointed in the way he has betrayed his trust in him and will be watching him. Doom then orders the Driver to return to Halo City. He has Billy load a special batch of nanoids onto the Nitro-Burn. He then commands the Nitro-Burn to drive into the Red House and release the nanoids. The nanoids disassemble everything in their path, people, equipment, and the building itself. Another set attach themselves to Herod and bond with him leaving him in constant pain. Doom finally meets with Cerebra. In gives to her his access codes to a teleportation system with stations all across the world. He leaves the codes in her hands, along with the X-Nation children. He then uses the teleport himself and disappears. 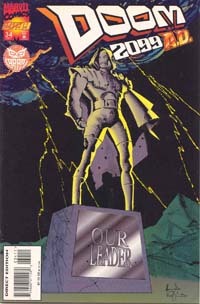 First appearance of Mark-III armor. 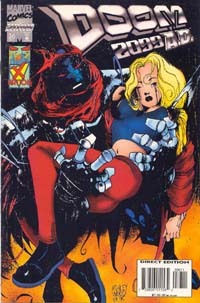 The scene where Doom shoots Morphine Sommers is also depicted in X-Men 2099 #30. Doom observes a news report on the supposed "death" of the Fantastic Four. Doom concludes that if they are indeed the originals then they are not dead. I would place this appearance between #37 and #38, shortly after his arrival in Halo City.